This photograph was taken many, many years ago when I was a very little girl. I am in the middle of the picture, holding the new doll I got for Christmas and looking (longingly) at my brother Paul's new drum set. 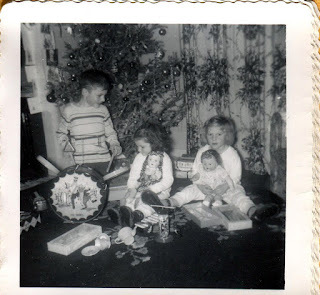 I distinctly remember that I preferred the drum set and would rather have gotten that for Christmas than a doll. Meanwhile, my sister Marilyn, on the right, has her foot on my leg. I put up with a lot from my sister. Ahhh! the joys of Christmas. Hope everyone has a happy one and that Santa is good to you!